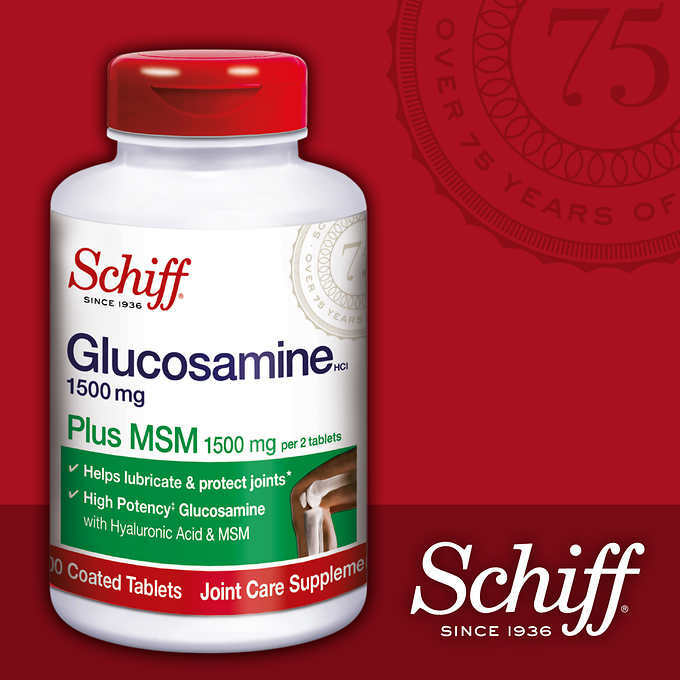 Promote joint movement and flexibility with Schiff® Glucosamine Plus MSM. Glucosamine is a natural compound that nourishes the connective tissue structures found in cartilage and joint fluid. Methylsulfonylmethane (MSM) is a natural source of sulfur found in the body which is important in the formation of collagen in joints. Just two tablets provide the clinically tested amounts of 1,500 mg of Glucosamine HCI and 1,500 mg of MSM. Schiff® uses Glucosamine Hydrochloride (HCI), which has the highest potency of active Glucosamine among Glucosamine forms. Glucosamine Hydrochloride is about 83% Glucosamine, while most brands use Glucosamine Sulfate that is only about 65% Glucosamine. For best results, take two (2) tablets daily with meals, either all at once OR one (1) tablet twice daily. Glucosamine Hydrochloride 1.5 g (1500 mg) - *, MSM (methylsulfonylmethane) 1.5 g (1500 mg) - *. If you are allergic to shellfish, please consult your health care professional before taking this product.